It's a familiar dance, played out over the dust and rocks of the last five years. At around five minutes after the service start time, they come into the sanctuary. It's a young Anglo couple, perhaps in their mid-twenties. They get a bulletin, and find their way into an open section of seats in my over-large church. Attendance is even more sparse than usual, in the upper-mid-twenties. The couple, who are dressed casually, look around at my rather unusual little flock. What they see isn't the great bunch of people that I've come to know over the past five years. They don't see the richness of perspective, or the array of very different personalities trying to grow in their faith. What they see is that the building is almost entirely empty, with 80% of the seating unoccupied. The people who are there do not look like them in any way, outside of also being bipedal hominids. Of the twenty-eight souls present, only three are Caucasian...myself and two seniors. The remainder are Korean, with one or two pan-Asian exceptions. There are no visible families. The church is largely self-segregated by gender, a residual of its roots as a gender-segregated Korean youth group. It looks very little like anything you'd ever have encountered in either the contemporary evangelical church or in a mainline denomination. That doesn't mean it's bad. Just different. But difference is, more often than not, a deal-breaker. Seeing them, I watch. I wait. They sing along quietly, and pass a few little whispers during the praise worship. He spends most of his time looking down. She catches my eye once, while I lead the prayer of confession. I see as they are warmly welcomed by the many good souls of the church during the passing of the peace, during which time I am obligated to set up my laptop for the sermon presentation. Moments later, as the first scripture is being read but before the sermon, I see them disappearing quietly out the side entrance. Total elapsed time: perhaps 19 minutes. This has happened dozens of times over the last five years, so it comes as little surprise. I am used to it. I expect it. Little idiosyncratic churches do not usually add random drop-ins to their number. It's not how we grow. I always find myself wishing that I could talk with these folks, to get to know just a teeny bit about them, but not as a way of clinging to them in that hungry, desperate way that tends to overcome small congregations. I want to know what blend of circumstances brought them to us. Was it the website? Our Facebook ads? Just random happenstance? What? I want to hear what they're looking for, and even though it ain't us, want the opportunity to help them find a faith community that will lead them into a deeper connection with God. Inigo Montoya: "Who ARE you!? The Dread Pirate Roberts: "No one of consequence." Inigo Montoya: "I must know!" The Dread Pirate Roberts: "Get used to disappointment." We have no AC. A series of power outages in the last few days blew out our aging compressor, which in turn is going to blow out a fairly sizable chunk out of our savings. Sigh. Sometimes the dream of American homeownership seems like one of those stress dreams when you're standing in front of your congregation and discover you're wearing bunny ears and a zebra-striped thong. At least, I hope that was only a dream. It was awfully vivid. As I stood outside with the HVAC tech, the smell of burnt-out electrics strong in my nostrils, the air around us filled up almost instantly with mosquitoes. They swept in like a hungry little cloud, fulfilling their prerogative for self-propagation. They're pretty much instant on, as the trails of carbon dioxide left behind by our respiration and the heat trace of our mammalian nature flags us as a potential blood feast. They are relentless little automatons, with but one purpose in their single-minded existence. For some reason, this resonated metaphorically with something that I'd noticed today in my blogging. 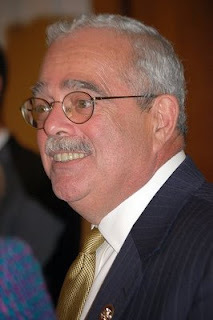 My recent gentle-blog-fun-poking at Rep. Gerry Connolly had apparently stirred two different responses. First, it got his staff to take a second look at my problem. After that initial hiccup, they've been doing great. I couldn't have expected more from a Representative, no matter what their party affiliation. Second, it drew the immediate attention of a number of local conservative bloggers, who pretty much all used it as an excuse to mock Rep. Connolly. It doesn't particularly matter that 1) it's an understandable error and 2) his staff has responded to my calling them out on a simple mistake by going well beyond what I'd have expected of them. "..tell me again how we got stuck with this guy," says one. Well, he spent over a decade in local politics and developed a reputation for being, depending on your perspective, either an something of a machine politician or someone gets things done. Then, more people voted for him than the other guy. "What an idiot," says another, as if anyone who has a solid grasp of constituent services believes Congressmen field their e-mail directly. Another blog appears to be entirely dedicated to finding negative things to say about this particular representative. I know, I know, it's just politics. It's always been this way. We'd like to think it hasn't, but we'd be deluding ourselves. Back during the earliest moments of the American republic, partisans on either side of the Federalist/Democrat divide would pitch out some pretty impressively scurrilous dirt at either John Adams or Thomas Jefferson, depending on their predilection. This is also the current reality of the political blogosphere, on both left and right. Many conservatives and liberals view their only role within the polis as drawing the other guy's blood. They spend their days carefully sniffing google for a trace of anything negative about that other guy, come swooping in the moment they taste it in the air, and then shout that negativity out in their own echochamber to generate those precious siteviews. Ah well. Politics is and has always been a blood sport. It's a pity reality, patience, and the common good matter so little in the face of such a single-minded pursuit. At a recent meeting in which I was asked my opinion about a range of individuals, I found myself in the peculiar position of being asked, only quasi-rhetorically: "Who DON'T you like?" I've always had a relatively easy time getting along with most people. Generally, I find that there is more pleasure to be found in seeking common ground with another than whackin' away at them with my Mighty Mjolnir of Righteousness. Even in those instances where I find myself in diametric opposition to someone on an issue, that quest for common ground is still front and center. Why? I guess I just have this weird fixation on grace. It's gratifying to enter into a web ranting contest with a rabidly and profanely aggressive neoatheist and come out the far side with a sense that some mutual respect has been found. It's spiritually uplifting to have a strident fundamentalist start a conversation with you by hurling both scripture and invective, and work your way around to realizing that hating one another isn't necessary. Those conversations smell far more richly of victory than napalm in the morning ever could. It doesn't always work, though. You can't always get folks to open up. Reason, humor, silliness, gentleness, and appeals to shared values and common humanity sometimes run crashing up against the brick wall of deeply seated hatreds and bias. People who have been so deeply hardened by cynicism and are woven through with negativity that they can't recognize any common value at all. Folks who are relentlessly narcissistic or engage in fetishistic worship of their own groupthink just can't recognize others as children of God. And there are people like that out there. You just can't get through to them. I'm pretty sure I'd have trouble getting along with Mahmoud Ahmedinajad. He's just going to hate me, no matter what I do and however I approached him. By his standards, I'm monstrous, my wife and kids are the personification of evil, and I'm pretty sure there's nothing I could do to make our time together pleasant. Maybe we could talk about fashion. He and I seem to have similar incompetence in that area. Or perhaps I could help him learn how to grow a real beard. That'd be a great topic, I'm sure. Ann Coulter would be equally trying company. I'm progressive, and that means that I am someone to be vilified and mocked in terms that generally embarrass decent company. Like Ahmedinajad, she relies utterly on her ability to polarize communities and condemn those who are different. People who build political or commercial careers by demonizing others tend to be a tad on the hard side to get along with. And Dear Ms. Coulter really has put her heart and soul into making herself a caricature of the ranting, smug, and rigid conservative. That's why Ms. Huffington keeps her on retainer. If she ever showed signs of being pleasant to a leftist, she'd never publish a book again. It would also blow that whole fascist Cruella De Vil schtick she's got goin' on. I'm also fairly sure ten minutes in the company of Perez Hilton would be nine minutes and forty seven seconds too long. As someone whose entire existence is dedicated to cattily defacing the lives and reputations and images (ew) of others, I'd doubt his soul has escaped unscathed. I could be wrong on that one, but whenever I've gone on his gossip site (research purposes only, mind you), I've felt like Nosferatu sunbathing on the Cote D'Azure. Only the other way around, if such a thing is possible. The absence of light is so intense, it burns. Any openly gay man who can manage to be so impressively cruel, self absorbed and foul tempered as to draw censure from most of America's gay rights organizations must be a real joy to be around. That I can't imagine being in close proximity to any of these folks is one thing. Liking them may not be possible. But though friendship with folks like these might not be possible, hating them is also not necessary. Opposing? Yes. Resisting their influence? Viewing them as enemies of what is good? Absolutely. But hate never serves any purpose. We are permitted to have folks we just don't like. That we still have to love them is the great challenge of Christian faith. The theist is a man firmly persuaded of the existence of a Supreme Being, as good as He is powerful, who has created all beings that are extensive, vegetative, sentient, and reflective; who perpetuates their species, who punishes crimes without cruelty, and rewards virtuous actions with kindness. The theist does not know how God punishes, how he protects, how he pardons, for he is not bold enough to flatter himself that he knows how God acts, but he knows that God acts and that He is just. Arguments against Providence do not shake him in his faith, because they are merely great arguments, and not proofs. He submits this to Providence, although he perceives only a few effects and a few signs of this Providence: and--judging of the things he does not see by the things he does see--he considers that this providence extends to all time and space. United by this principle with the rest of the universe, he does not embrace any of the sects, all of which contradict one another. His religion is the most ancient and the most widespread, for the simple worship of a God has preceded all of the systems of the world. He speaks a language that all peoples understand, while they do not understand one another. He has brothers from Peking to Cayenne, and he counts all wise men as his brethren. He believes that religion does not consist either in the opinions of an unintelligible metaphysic, or in vain display, but in worship and justice. The doing of good, there is his service; being submissive to God, there is his doctrine. The Mohammedan cries to him: "Have a care if you do not make the pilgrimage to Mecca!" "Woe unto you," says a Recollet, "if you do not make a journey to our Lady of Loretto!" 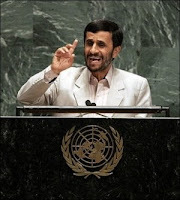 He laughs at Loretto and at Mecca; but he succors the needy and he defends the oppressed. Having pitched out a little snark on this blog a few days ago about a lackadaisical response from my Congressman's e-mail constituent services folks, I really hadn't anticipated receiving any significant reply. Honestly, I'd been slightly surprised, if only because Rep. Gerry Connolly had been active in local politics for decades here in Fairfax, and had a reputation as being pretty on the ball on that front. I didn't blame him personally for it. As a DC townie, I understand that Congressmen typically get a massive volume of constituent requests. While my desire not to be forcibly detained again when I cross the US border is strong, I realize I ain't the only fish in the sea. In reviewing my daily Google Analytics reports yesterday, I noticed that there were a few more visitors than usual on that particular post. Hmmm, thought I. Any Congressman worth his salt has folks whose task is to google them daily for any pertinent web-chatter. Perhaps someone out there is paying attention. That turns out to have been the case. Yesterday afternoon, I received a deeply apologetic and very personalized message from his staff. That came along with some useful information about how to deal with the issue and an offer to provide the assistance of his office in resolving my little problem with the Department of Homeland Security. It'll be interesting to see how it works out, but I have to admit that I'm feeling a whole bunch more impressed with Connolly's folks now than I was a few days ago. 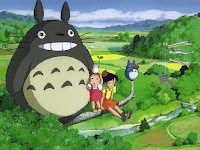 I still think that picture makes him look a bit like Totoro, though. "Love God with all your heart and all your soul and all your mind, and love your neighbor as yourself." This familiar quotation surfaced several times in several forms in my reading of Voltaire's Dictionnaire Philosophique yesterday. Though it seems pretty basic, it's worth another look. It's kinda important. Jesus articulated this as the primary purpose of human existence, and it's a concept with traction. He did not say that the authority of the church is the point of being alive. He did not say that the universe was 6,000 years old, and that this concept must be defended at all costs because the Bible is empirically infallible. He called on his followers to do those two simple things, which are really just one simple thing, and in doing so find themselves reconciled to both the world around them and fellow human beings. It's a pretty straightforward request, and has enough inherent and self-evident goodness about it that even a freethinking enlightenment philosopher like Voltaire can take a hard look and say, "Yup, that's a good thing. I'm up for that." He said it with considerably more grace and wit, but that's the general principle. What is most striking about his acceptance of this axiom is not the embrace of the second part of the statement. Loving your neighbor as yourself, the ethic of radical compassion, is pretty elemental. But Voltaire embraces the whole thing, both love of God and love of neighbor. Here's the fuddler: can you do just the latter? Can an ethic of radical compassion exist if you say: "You know, I'm up for love. That's great. Love is cool. But the whole God thing just doesn't work for me." There are plenty of humanists who make that statement, because the inherent value in compassion just walks right up and gives you a big hug. Who doesn't like compassion and empathy? Besides Hannity, Coulter, and Limbaugh, that is. On the one hand, I think that ethic of compassion can guide the lives of those who are not people of faith. I'd be willfully deceiving myself if I denied that many secular people live peaceful lives filled with acts of caring for others. Denying the spiritual value and validity of those acts of caring is one of the deeply irritating spiritual ticks of my co-religionists. A God who hates a kindly act because it isn't done in His name wouldn't be worth following. I think you've just got to call something good when it's self-evidently good. On the other hand, the love of God is in a real sense necessary if you're going to love your neighbor. Why? Because truly loving God with all your heart and all your mind and all your soul leaves no room for the love of certain other things. It leaves no space for nationalism, or profiteering, or racial bias, or gender bias, or partisanship. It leaves no space for all of the various categories we use to define "us" over and against "them." That mystic orientation towards something that transcends not just society and culture, but spacetime itself...if done authentically...radically enables us to see past the things that divide us. It enables us not just to love those who are part of "us," but to love across the ultimately meaningless boundaries we establish between ourselves and those we think are our enemies. That isn't to say that a focus on the transcendent and the eternal can't be subverted and misused. Nearly every religious tradition struggles against those that would use it as a means of coercing and controlling others, or as an excuse for hating others. All sorts of narsty things make absolute claims on us, and when we yield to them, all sorts of unpleasantness occurs. That said, I think if we are to see our neighbor as ourselves, we have to be able to look past our individual and collective expectations, past even the categorical forms and structures of reason itself. If we're going to be continually growing in understanding and compassion for the often very strange Other, and shattering the boundaries that divide us, we do that most effectively by setting our hearts on that which stands infinitely beyond us. There's nothing like kicking back with some light summer reading. "Light" is relative, and for me, "light" doesn't mean Stephen King or the latest Twilight-knockoff about Sexii Vampyres. I try to read those things, but whenever I do, my entire brain just shuts down completely. I think it's some kind of allergic reaction. The EMT folks told me that they won't even try to restart my heart next time around. "Light reading" this summer means Voltaire. Yes, I'm getting into enlightenment philosophy for entertainment. Please, please do not go hatin'. Sure, I'm reading the Dictionnaire Philosophique, and that may sound seriously snooty or possibly French to most of My Fellow Americans, but Voltaire ain't Hegel or Derrida. The Enlightenment permitted philosophers to play with words and wit in a way that seems to elude most postmodern academics. He's tres amusante. Really. What's particularly interesting about my reading are those sections that speak directly to matters of faith, and to Christianity. What I'm finding about Voltaire is that he utterly despised the church for all the right reasons. 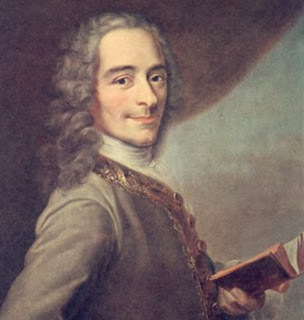 Voltaire saw the corruption that wealth and power brought into the institutional church, and reviled it with a passion. He saw churchmen of his day who lived like kings, surrounded by servants and the biggest houses and the best things, and he realized that such a life was completely antithetical to the form of virtue that they claimed to profess. He'd have just loved Joel Osteen. Though Voltaire hated the church with a deep and abiding passion, he apparently did not feel the same way about Jesus. In the section of the Dictionnaire Philosophique that is simply entitled "Religion," Voltaire describes a fictionalized religious experience. First, he describes how deeply he glories in the wonders of creation, in its complexity and inherent gracefulness. Then, he has an exchange with an angel, who shows him the horrors wrought by sectarian violence. From there, he moves on to speak with some great wise men. Finally, he encounters a nameless man who is obviously Jesus, lamenting over those who have suffered and died in conflicts over him, and over the wealth that has been gathered in his name. The man will not give his name, so Voltaire "...implores him to tell me in what true religion consisted." The man replies: "Have I not already told you? Love God and your fellow creature as yourself." At this, Voltaire declares that he takes him as his only master. Voltaire clearly felt that this ethic was at the heart of all faith, at least, all legitimate faith. That ethic, he argues repeatedly, is a true universal, something that reaches across cultures and languages and peoples. It is this line of thinking that lies at the foundation of that famous Voltaire quotation: "There is only one morality, just as there is only one geometry." What I find myself thinkin' on is this: how does this relate to the emergent, postmodern church? In this era, we're fond of declaring that morality and ethics are culturally mediated. There is no "higher" truth, because truth is relative. Even progressive Christians tend to make this statement. But I tend to come down with my Voltaire on this one. There is something about the core teachings of Jesus that goes well beyond cultural norms and societal expectations and down deep into the basic structure and purpose of human existence. Believing that seems necessary if you're going to bother calling yourself Christian. Last year, when I crossed over into the United States from Canada, I had the dubious pleasure of being flagged by a Homeland Security database at the border as a dangerous felon. The time in between my being taken into custody and them figuring out I wasn't the person they thought I was wasn't particularly fun. Next month, my family has a trip planned that will once again take us across US borders, and I'd thought it might make some sense to try to resolve the issue before I spend some more time in a holding cell. I'd tried writing my representative in Congress last year when it happened, but I never heard back. Not a surprise, as he was leaving office. Knowing this travel was coming up, I tried again with his successor, Rep. Gerry Connolly, two months ago. Today, I finally got a response. Thank you for contacting me about _________. I appreciate your interest in this issue and your views are important to me. As a Member of Congress, it is essential that I know my constituents' thoughts and concerns so I can best represent their interests in Congress. I will continue to watch this issue closely going forward to determine if any Congressional action is necessary. Once again, thank you for expressing your concern on this very important issue. I enjoyed hearing from you. For more information on my views on other issues, please feel free to visit my website at http://connolly.house.gov. I also encourage you to visit the website to sign up for my e-newsletter. I guess it must have been too difficult for this particular boilerplate form to handle my lil problem. "Thank you for contacting me about your false arrest on the United States border. I appreciate your interest in this issue and your views are important to me," does sound a bit on the lame side, but at least it would have shown some marginal effort. I hadn't really expected a substantive response, but you'd at least think his interns would have been told that they're supposed to fill in the blank in the first sentence. Ah well. Democracy in action, eh? As it so happens, folks on his staff are more on the ball than I thought. More here. One of the ways I tend to feel closest to God's presence in my admittedly rather feeble prayer life is by practicing self-emptying. Through stillness, song, or walking meditation, I try to still my endlessly nattering inner commentary. When that happens, which tends to be in little flickers here and there, I find myself feeling increasingly centered and deeply calm. I feel connected to that which transcends me, and to everything around me. Those moments are a delight. The other day, after just such a moment, I found myself reflecting upon that state of being. In particular, I found my returning higher functions wondering if the silencing of my internal narrative represented a retrogression of sorts. When all I am is sensory inputs in the absence of any discernable thoughts, is that in some way analogous to the existence of "lower" forms of life? Creatures that exist in the absence of any language or symbolic forms of self expression must experience life in a similar way, being deeply and unreflectively in the moment. Yet what struck me as peculiar about the act of meditation this week was that silencing my higher functions and seeking negation doesn't light up my...ah...more...um...animal self. I do not become more ferociously competitive, or hungrier, or so horny that me want to love you longtime. Those parts of me that are just a few genetic ticks away from having a bit part in Treachery and Greed on the Planet of the Apes aren't released when I let my "self" grow still. I just feel more connected, more at peace and at one with others...and more compassionate. When faced with conflict or deeply troubled, these forms of prayer are where I go, and I come out of them not just mentally more level, but physically calmer. My body is involved in the process, and it is significantly impacted. But it is only when I still those higher functions, what I would typify as my reason or symbolic awareness, that I reach that elusive peak state of oneness. This is a common understanding of the mystic wings of all of the world's significant faith traditions, yet it flies in the face of a common assumption. That assumption is the good ol' Cartesian split between mind and body. The idea...and it is a modern one...is that it is reason that balances and controls the snarling red-in-tooth and claw beast that lurks in our animal nature. Reason must be good. Our emotional and physical responses? They must be controlled and limited by reason. But reason and intellectual rigor are not the answer. This comes as a great disappointment to my fellow Presbyterians. Both mind and body must be stilled, if we are to be opened to the self-emptying of a Christ-centered existence. Over the past several months, I've been chewing over the ethic of abundance in the context of Christian faith. Abundance is the the keyword for a huge portion of contemporary Christianity, particularly that portion that likes to call itself the Word Faith movement. Word-Faithers, who preach what's generally called the prosperity gospel, tell us that to receive abundantly, you must give abundantly. The more you give, the more you'll get. Want to get right with God? Then tithe! Add to your tithing! Double-tithe! Everyone loves a Holy High Roller! Be a blessing, and you will be blessed! This version of the Gospel is chirruped from countless megachurch stages, and sparkles alluringly as it passes through the gleaming perfect teeth of folks like Joel Osteen and Creflo A. Dollar. It's great for fundraising. It's so great, in fact, that some recent seminars in my otherwise staid oldline denomination have encouraged just such an attitude. 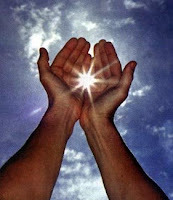 If you feel rich, if you feel "abundant," then you tend to give abundantly. Cheap or thrifty people make for lousy pledge units. There is truth in that, a truth that's been carefully encouraged by charlatans throughout the ages. It's a biblical truth, though, and you can't for a moment dismiss it out of hand. 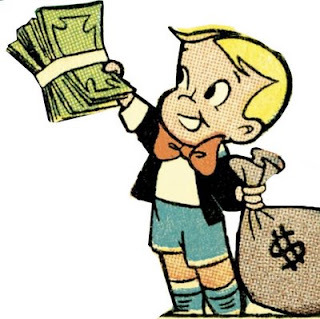 When the Apostle Paul exhorts the money and power obsessed Corinthians to give joyously and generously, he's not being a hoochie-pastor. He's encouraging unselfishness to a people who live only for themselves. Generosity is an essential Christian virtue. Understanding Paul, though, requires us to understand Christ on the subject, and Jesus is pretty specific about how our hearts need to be aligned. Are we to be "rich in spirit?" Um...actually...no. The rich don't really get many props from Jesus. In fact, they get hammered. Those who are wealthy now? They've gotten theirs, and they ain't gettin' anything more, unless by "more" you mean a painful existential wedgie from the Big Guy on the Day of Reckoning. Instead, we are to be "poor in spirit." But what does that mean? It doesn't mean being cheap. It does mean not seeking wealth, or desiring to hold on to wealth. It means not desiring wealth, not grasping wealth, not holding on to wealth. It means having nothing, no matter how much you actually have. Having wealth means nothing. Not having wealth means nothing. A being that is oriented towards God and moved by God's grace will naturally give where there is need, because they don't care about themselves more than they care about others. The poor in spirit are abundant, generous beings, because everything they have can be turned to the service of those around them. They pour themselves out. Where the Word Faith movement fails is where it inserts self-interest into the equation. Why do you give? To be blessed. But giving seeking blessings in return means exactly jack to Jesus. It's selfish, and self absorbed, and the exact opposite of the mindset that Jesus would have us embrace. Pixar just amazes me. Almost every time I go to one of their films, I have this expectation: This will be, finally, the mediocre one. They can't all be good. Everyone messes up now and again. The creative process just isn't that consistent. Every once in a while, you make something that is very slightly craptacular. You can't help it. This afternoon, I went with Rache and the boys to go see "Up." Thanks to Beltway traffic, we arrived immediately before it began, which in a sold out theater meant we had to sit in the very front row. I haven't intentionally done that since I was a late-tween, when I plunked my scrawny behind down in the front row for Return of the Jedi. I spent the whole movie looking up at the vast screen before me, which seemed appropriate, if a little taxing on my aging vertebrae. It ended up not making a difference. The film did not disappoint. What is simply stunning about Pixar is not their technical proficiency, although that is certainly there. It's that the whole 3D CG thing doesn't get in the way of some strikingly effective storytelling. It's real pathos, genuine and potent. It's deep and profoundly human, yet totally accessible. A great film, and one that plays interestingly off of a thread that's been on my mind a whole bunch recently. That thread is the division of the generations, a deep and systemic rift in our culture that flies in the face of the Christian message. The breaching of that divide was, in part, the whole point of UP. 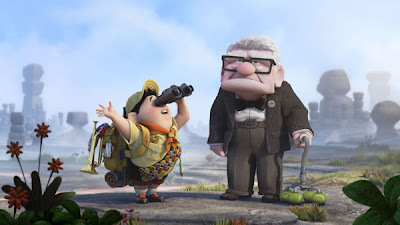 But where Pixar pitches out a story...shoot, a parable...that establishes commonality between young and old, we Jesus people seem totally unable to figger that one out. In particular, I struggle with how the generational divide has popped it's mutant gopher head out of the emergent church gopherhole. The emergent church, or so the idea goes, is a "young" and "trendy" church that appeals to "young adults" who are looking for a "postmodern" and "relevant" church experience that "speaks to them" and "provides free wifi." All of these things are fine, up to a point. Where they cease to be fine is when a movement that exists to serve the Gospel starts focusing more on the dynamics and processes of a single demographic than it focuses on the universal values that make Christianity worth bothering with in the first place. Conversation and relational ethics are at the heart of the emergent movement, and it is in that powerful, creative dynamic that emergence has its strength. If those conversations and relationships are limited to conversations within the movement, as young and youngish folks with hipster glasses natter on to each other about stuff they all can relate to, then the movement will fail. It'll be just another reason for folks to go to conferences where they can find other people like themselves, and when we seek those who are "us" and not "other," we're delimiting our possibilities for growth. But if the tranforming relationships the emergent movement declares as central to our faith are forged across generations, across cultures, and across theological lines, then...well...then maybe the Spirit is at work. A few months ago, my wife found herself in possession of a satellite radio for our little commuter-box of a car. The point of that was, of course, to connect her with the vast array of offerings on XM, and to thus make her day-to-day commute a little more tolerable. I hadn't been using the radio much, but a recent solo long-distance trip through rural Maryland suddenly had me appreciating it. When your only over-the-air choices are country and country, it's nice to have something to fall back on that hasn't been pre-masticated by executives in Nashville. I'm actually a pretty big fan of bluegrass, but can't stand Corporate Country. The Man is still the Man, even if he wears boots and a cowboy hat. So I prowled through the hundred-plus XM channels, looking for something that just...clicked. What amazed me was the channel I ended up sticking with. It wasn't current music. It wasn't hip-pop or altrock. It wasn't the music of my own youth or young adulthood. It was barely even the music of my parent's youth. It was big band and swing music of the 1930s and 1940s. Stuff like Artie Shaw and Benny Goodman, Duke Ellington and Count Basie, some sweet live Cab Calloway and Tommy Dorsey mixing like butter with Sinatra. I listened for hours. I just sat and droned along in our little xB, listening to a calvacade of long deceased swing icons, and even the absence of cruise control and an engine overmatched for mountain driving didn't dampen my enjoyment of the trip. Swing and big band sound had a brief hipster revival back in the 1990s, but it has since drifted back into the haze of musical history. This is a pity, because it's just so...alive. It was the pop music of that generation, and I find myself preferring it to the pop music of this generation. It shows musical accomplishment that isn't studio-dependent. It's suave and elegant, not brutal and profane. And it's...young. It was then, and you can feel the passion and physicality of youth moving in it now. Preferences aside, though, it stirs me to wonder why it is that church is so obsessed with mimicking our societal obsession with generational fragmentation. There is a dissonance, I think, between being "relevant" and being "counter-cultural," and if church is to be authentic in it's articulation of the Gospel, it needs to be in greatest tension with the culture, both in form and in purpose. Nowhere is this clearer than in our churchy replication of the separation of ages, kids from tweeners from youth from young adults from young marrieds from older marrieds from retirees from the old from the old old. Ministries box us in by demographic and microtarget interest groups like a marketer on meth, even though the whole point of Christian faith is the shattering of the boundaries between us. This despite the fact that we grow most in faith and come to know Christ in the the crucible of the other. And sometimes, just sometimes, the other knows music that we don't, and that will speak to us in ways we never anticipated. As I struggled with the thrust of my sermon today, mental cogs graunching as competing concepts ground against one another, the phone rang on the desk of my home office. I picked it up. There was a pause, that cursed pause that comes as a computer assesses whether or not it's got you. I did what I never do, and waited. "This is Credit Card Services, with an important alert. We've determined that you're paying too much interest on your current balance, and need you to call us immediately so that we can adjust your rate. Please press 6 to speak with a customer service representative." I have no credit card balance. I never do. Not that they know or care. They're just trolling for suckers. Wanting to get off their list, I pressed six. There was a pause, then a woman spoke in a bored drawl that could only come from a small cubicle in a large, overlit room. "This is Credit Card Services. Did you press six to reduce your interest rate?" "No, I wanted to talk to someone about being taken off your call list." There was a click, and silence. She'd hung up on me. I was amazed. That's actually not legal. At least, I don't think it is. As I sat there, wondering how I might follow up on this amazingly annoying firm, the sound of a ring came through on the other end, as if I'd just called someone. The same bored drawl came through the phone. "Um, no, I, uh wanted to talk with someone about you not calling me again, and..." There was a click, and silence. Huh, thought I. I stayed on the line. There was a ring on the other end again, and a different voice answered. It was a man, youngish, also bored. "No, I was hoping to speak with someone about getting off your call list. If there's a manager I..." There was a click, and silence. Then a ring, and a woman answered, in a tone that told me she was a young African American. Then it dawned on me like the rising of the morning sun over Bangalore: They couldn't hang up. They had clearly been instructed by their hellish quasi-criminal social pariah TelemarkeBoss to simply hang up on anyone who asked that question. But the message hadn't gotten to their phone system. The computer that dialed for them would cut you off when they hung up...but it wouldn't disconnect until I hung up. They were trapped. I had them. I switched to speakerphone. "I did press six," I said. "But not for that reason." "Do you have more than $4,000 in credit card debt," she asked. "No, but I do want to figure out how to get you to stop calling." There was a click. I grinned. The phone rang. For the next twenty minutes, I kept letting them try not to call me, leaving the speakerphone on as I worked on church reports. They tried hanging up. I kept coming back. They tried leaving the phone on their desks, while I heard folks jabbering in the background. I pressed buttons to send rhythmic tones through to them. They tried hanging up again. No dice. Eventually, they found a manager...but only after twenty-five minutes of passing me around the office. Having blogged about ethics, actions, and subjectivity yesterday, I find myself wishing that the day had not served up such an excellent case study. The shooting of a guard in the Holocaust Museum here in DC yesterday was the act of someone who strongly felt the world was a certain way. That blighted soul is a virulently hateful man by the name of James Von Brunn. This being the internet era, the first thing I did on hearing the news was google him...and a few moments later, I found myself on his website, a rather clumsy festival of hatred entitled "Holy Western Empire." The site no longer exists today, having been shut down by his service provider. Remnants and fragments can still be found cached on google, and they're plenty to give you a sense of the darkness that governed this man. Now that the site is down, it's hard to access it, but I managed to get hold of the unpublished manuscript that Von Brunn considered...and still considers, given that he ain't dead yet...his life's greatest work. The manuscript, which I found republished on a white supremacist site in Australia, is entitled "Kill The Best Gentiles." For reasons that I myself can't quite fathom, I spent much of this morning reading it. It is, for all of the media buzz today that Von Brunn was a brilliant, angry loner, not the work of a genius. If he got into Mensa, then Mensa must have considerably lowered their standards. The book is a clumsy, EMPHASIZE THINGS IN ALL CAPS pastiche of every racist conspiracy theory ever generated. Illuminati? He's got them. Jewish control of media and finance? It's in there. The Holocaust never happened? He'd say so. Jews aren't in fact Hebrew at all, but an Asiatic usurper race? Um...yeah...but...huh? Jews are interested in preserving their bloodlines and simultaneously obsessed with interbreeding with "white people?" Err...um...isn't that...aaah...inherently contradictory? But consistency and internal integrity of argument were apparently irrelevant. Only hate is relevant. The only reason to make arguments is to reinforce an already all consuming hatred. What's clear is that Von Brunn deeply and passionately believed what he believed. Those beliefs...that seething, governing anger...made it possible for him to enter a place dedicated to the memory of millions of innocent dead, and to open fire, taking the life of another innocent in the process. Having forced myself to read his writing, I can confirm that he undeniably feels, down to the core of his being, that he was justified in his actions. That feeling means nothing. That he truly felt he was defending the integrity of the Aryan race means exactly diddly. Sure, one could argue that his pattern of thinking is a form of insanity. In a way, it is. Reality means nothing to someone who exists only for their own bitterness. But as a person of faith, I know that reality...both our intents and how we express those intents into the fabric of being...is the ultimate measure of our actions. Our time here in creation is not "unbearably light," as Milan Kundera once misdescribed it. It is infinitely heavy, and infinitely valuable. Further, I know that both the fruits of our intents and the intents themselves are the measure of how our Creator holds us to account. Von Brunn rejects this, of course. His anger against Christians for our "false dogma" of compassion and love is woven throughout his bilious little screed. For him, it is a sign of our weakness. But I fear he misunderstands the nature of our love, and of the love that is God. That God is love does not mean that God is weak, or that God is not just. It does mean that His justice is deeper and more terrible than we can imagine. It is unfortunate that those like Mr. Von Brunn who live for hate do not realize this. This particular line of thought just keeps surfacing for me this week. It's popped up in the blogosphere, in a series of random conversations with an old blog jousting buddy about abortion. It's come out of the mouth of the swim instructor at my kid's pool, in desperate response to the total entropic randomness of a moist horde of summer-addled tweeners. Whenever it's surfaced, I find myself struggling. On the one hand, it's very non-judgmental. It's a happy warm fuzzy thing to say, particularly to someone who has completely messed up their life through a series of cascading errors. The meth and the string of armed robberies and those four kids you fathered with three different women were just bad choices on your part. You're still a good person. 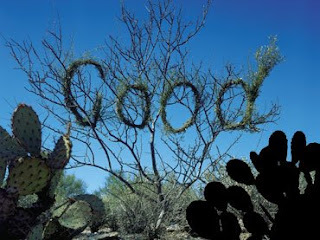 It permits people to say to themselves, gosh and golly, if I'm a good person, then I should act like a good person. I'd like to believe that, and on some levels, I do believe that. Leaving space and grace for redemption is kinda important for all of us. On the other hand, I think that the choices we make define us. We have no meaningful existence as ethical or moral entities outside of the decisions we make, particularly the decisions that impact other beings. If I choose to deck you with an unexpected uppercut because I truly believe you deserve it for being such a pinhead, my belief that you are a pinhead does not abrogate the very actual harm that I have caused you. If I lend you money at an exorbitant interest rate using your car title as collateral because I believe that making a profit in any way possible is my right as a businessperson, that belief does not mean that what I am doing is acceptable to anyone other than me. If I hack off your arm with a machete because I genuinely believe that your tribe is subhuman and needs to be put in its place, that subjective perspective does not in any way diminish the objective anguish that my actions have caused. Those opinions and beliefs may form my rationale, and may be part of the ethos that formed me, but they do not mitigate against the specific and actual harm that I have caused another being. As a person of faith, I see the ethical function of faith as being the thing that shatters our individual and cultural subjectivity, and brings us into an ecstatic awareness of the Other. That is the heart of a morality founded in compassion, which is the core ethical thrust of all Christian teaching. Ultimately, the purpose of an ethic founded in love and compassion is to move us away from the claustrophobic moral onanism of the subjective, and to engage us more deeply in the actuality of being that exists beyond our limited selves and self perception. Early summertime is always a fallow time for blogging, and it ain't 'cause the livin' is easy. It's because my days and afternoons grow tighter with kid-related activities, and for some reason, those activities seem to crowd out cohesive creative thinking. Yesterday, for instance, my morning was segmented into 1) taking my older son to his annual checkup, where he got a painful battery of shots and 2) spending a great deal of time trying to find the cellphone that my younger son had craftily hidden under the sound-deadening beanbag chair in his room. Only one of these involved intermittent screaming, and it wasn't the first one. The afternoon progressed similarly. 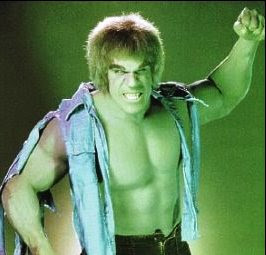 First, haircuts for myself and the little guy, who was starting to resemble Lou Ferrigno in the 1980s Hulk TV show, if Mr. Ferrigno had been one-fifth his size and slightly less green. Then, off to the drum lesson for the little guy, during which time I did some shopping for dinner. Immediately following this came swim practice, then home to slap together a dinner...one involving actual vegetables and a minimum of plastic-encased microwaveable synth-food... before taking the big guy to scouting. Though I chafe at this pace early in the season, I do always adapt to it. A few weeks in, things gets more manageable as I find my stride and acclimatize to the pace of the average suburban American mom. What always strikes me, though, is how little room this cultural approach to life leaves for creative expression or deeper awareness of anything beyond the prosaic demands of children's schedules. If your mind is consumed with these things, other things...like developing an artistic or musical gift and/or organizing the adult groups that are the sinews and tendons of a healthy community...can easily fall into disuse and disrepair. As my little congregation continues to wrestle with some pretty deep organizational and spiritual challenges, I find myself struggling with where my own prayer and meditation fits into the whole paid staffer thing. On the one hand, it's easy to get sucked into the organizational dynamics of the church. It's the prepping of budgets and crafting of strategic planning memos, having Serious Discussions About Our Future, then more meetings, planning retreats, and then having still more meetings. It's the Presbyterian way, and it's work, in the same way that secular work is work. You are earning your keep. You are making sure you add value to the organization. You're an employee. But there are days when what the Spirit wants me to do is anything but sit in my office dithering over the details of this Sunday's liturgy, or using mindmapping software to conceptualize possible futures for the ministry, or scurrying to another meeting. I feel the need to go deep and be centered, to go focus, to leave the office and the demands of the church as an organization. Though church is typically the center of my faith life, I do find myself with the deep Jesus urge to get the heck out of Dodge now and again. The conflicts and struggles that have recently riven my little community color the spirit of the sanctuary, particularly when I'm seeking calm. And as I feel the stresses and uncertainties of my own life like shards of glass around my heart, I know I'm not providing the conduit to the Creator's presence that the church needs. I prefer walking meditation, and I do walk. But I also find need for stillness. Problem is...where to find it? Where to find a little sacred space, where I can be securely away from people and their scurrying and bustling? In seminary, that place was an old dusty storeroom above the chapel entrance. But I've been feeling that yearning for a new place lately. On Sunday, I went looking for such a quiet place, walking mindfully through the woods that run alongside the banks of the Potomac. Perhaps a well placed log by the waterside? Or a little grotto speckled with flowers and leaf-scattered light? As I searched by the riverside for a place that might serve for silent prayer, I came across a tree. It was a great immense thing, thickening out so much enough around the base that four grown men couldn't put their arms fully around it. It sat by the waterside, within both view and earshot of the soft nickering of the flood-browned river. Where living wood met earth, I found a natural opening, half my height and shaped like a door. Inside that door into the tree, there was a dirt floored room more than six feet in diameter, with a ceiling that rose up beyond my outstretched arm into dark moist stillness. It was, for all intents and purposes, a little prayer cell. One of the things that struck me in my post yesterday about the pro-life movement is their strange recent obsession with duct tape. Back when I was a youngling, folks protesting abortion pretty much stuck to signs and slogans. In the last few years, though, there's a symbolic protest that seems to have completely permeated the pro-life community: The Life Tape. 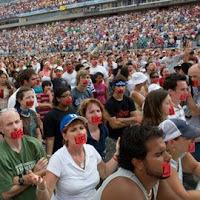 Protesters stand in front of courthouses or in big prayer meetings, with their mouths taped shut with red tape, the word "LIFE" written across the front in big bold capital letters. As I wrote up yesterday's post, I found myself wondering about the genesis of this rather creepy and oddly fetishistic form of protest. A few googled keystrokes later, I found myself at the heart of this movement, the website of "bound4LIFE." This...um...had nothing to do with dominatrixes. Really. Click on the link. See for yourself. The idea behind the tape over the mouth thing is that the "pre-born" cannot speak for themselves, and as a way of articulating that inability to speak for and defend themselves, pro-lifers give up their ability to speak. They are also showing themselves in solidarity with the victims of what they view as a genocide. While I can see where this idea came from, and see the conceptual foundation for it, it doesn't work for me on several levels. First, it has the effect of dehumanizing the protesters. It seems like a mask of sorts, something that prevents you from seeing or fully knowing the person protesting. A significant proportion of the human face is obscured, and the essential humanity of the demonstrator is thus similarly obscured. If you're trying to make a basic point about humanity, removing a significant part of your own humanity just seems counterproductive. Second, it's just too convoluted and "in-group" to effectively convey it's meaning. I had no idea exactly why folks did this until I bothered looking into it. You know it has something to do with being pro-life, but the precise meaning is not really that obvious. Even on the website, it's hard to figure out exact what the core meaning and purpose is. Sure, it's a striking image, and those who are demonstrating are aware of why they're doing what they're doing. But no-one outside of their community grasps it. That, I suppose, leads up to the third and most challenging element of this movement. A significant subtext of removing your ability to speak is that it...well...seems to indicate an unwillingness to engage in conversation on the subject. What it says is: I cannot talk to you. I am not interested in talking to you. Read the word on the front, and then go away. If you're supposed to be speaking for those who cannot speak for themselves, giving up your ability to speak seems, again, a bit counterproductive. Of course, given the deeply polarizing rhetoric around abortion, maybe this isn't a bad thing. In an unintentioned way, the bound4Life tape is symbolic of our collective failure to have meaningful and productive conversations on the issue of abortion. I do not say this as a particular indictment of the pro-life movement. Both camps have become gagged by their own ideology, unable to speak to one another, and unable to engage in the kind of respectful and relationship-driven conversation that is the only way out of this societal morass. The recent slaying of a doctor who provided abortion services resurfaced something that has always troubled me about the pro-life movement. Without question, the vast majority of pro-lifers oppose murdering doctors and clinic workers. Killing other human beings is in direct opposition to the life-ethic that those who oppose abortion espouse, and it's certainly antithetical to the core teachings of Christian faith. Where things have always seemed peculiar is in the disconnect between the rhetoric of the pro-life movement and the way that movement articulates itself socially and politically. Abortion is, in the language and frameworks of the pro-life movement, murder. Though there aren't plain-text scriptural grounds for conservative Christians who make this assertion, folks who hold this worldview understand abortion as the intentional slaying of another human being. It is also something that is systematically practiced, making it...again, in the language of the pro-life movement...akin to genocide. Doctors who routinely perform abortions are mass murderers. A society that tolerates and permits abortion is engaged the moral equivalent of eugenic cleansing, no less horrific than the eugenics of the National Socialist movement in the 1930s. For those within the movement, these aren't hyperbolic straw men. These are the core ways in which American conservatives articulate their opposition to abortion. What I can't quite grasp is how the pro-life movement as it has existed over the last several decades can believe all of these things and be as...well...passive as it is. The vast majority of folks who believe that all of the statements in the previous paragraph are an accurate description of reality are just going about their day-to-day lives. They might write a letter or two to their congressman annually, provide funds to pro-life organizations, have a bumper sticker, or occasionally show up at a demonstration. But they are otherwise indistinguishable from everyone else. This strikes me as odd. Why? A recent Gallup poll indicated that for the first time, slightly more Americans self-identify as pro-life than identify as pro-choice. Within the pro-life group, those believing that abortion should be illegal under all circumstances represent 23% of the population. Applying that percentage to the baseline number of voters registered in America, that means that around 38 million citizens believe that abortion is wrong in all circumstances, and that it is...well...murder. Yet though tens of millions hold this position, there is no similarly massive campaign of peaceful civil disobedience. Rotating teams of tens of thousands of protesters aren't engaged in 24-7 non-violent physical resistance. Our local jails aren't filled with conservative moms and dads and teens who have laid their bodies down to physically block access to clinics in which they believe mass murder is being perpetrated. If a nearby orphanage was regularly culling unwanted children, or if Sunrise Retirement Communities had a cost-benefit-termination clause for the elderly, I'm fairly sure I'd be both outraged and active...even to the point of getting arrested. The lives of other human beings are worth it. Being arrested is, admittedly, both unpleasant and inconvenient. Folks have to go to work to provide for their families. Kids need to be home schooled, or taken to Young Life programs. Prison time gets in the way of those things. But how you can on the one hand believe that millions upon millions of innocent human beings are being murdered and on the other be...well...doing basically nothing about it...has never computed. As reprehensible as yesterday's killing was, it seems in its own horrid way more coherent than the strange acquiescence of those who talk a great deal about abortion or nod their head when their pastor laments about it, yet go about their lives as if that doesn't actually mean anything to them.